One of the criticisms of hip-hop that’s arisen over the past couple years is a disconnect with the audience. Drake said something recently – and accurately – about Jay-Z not being able to go four bars without referencing fine art. Jay-Z and Kanye may be at the top, but their tales of luxury and fine living have become off-putting. That’s what makes rappers like Supastition so important. “Honest Living” is dedicated to and directly inspired by the working class. The EP’s inspiration comes from North Carolina becoming the first state to eliminate federal unemployment benefits last year (come on, North Carolina, how evil do you have to be?). As the state’s economy crumbled further, Supastition himself was looking for work, documented in this release. “Honest Living” is a cohesive EP, about the pain felt through North Carolina and the discord felt between the comfortably rich and the poor that have been hurt by the state. Although “Two Weeks Notice” starts with a a snarky bit of a businessman talking about golf, this EP isn’t exactly ‘angry,’ even though it easily could be. It instead has an aura of passive and informational aggression. Supastition wants to teach listeners, in a way that anger would not allow. He wants to teach listeners what it’s like “living in areas they won’t even deliver pizza to,” as he says in the song “Honest Living.” The EP retains a consistent, relaxed tone, even if the lyrics are thematically heavy and rightly emotional. 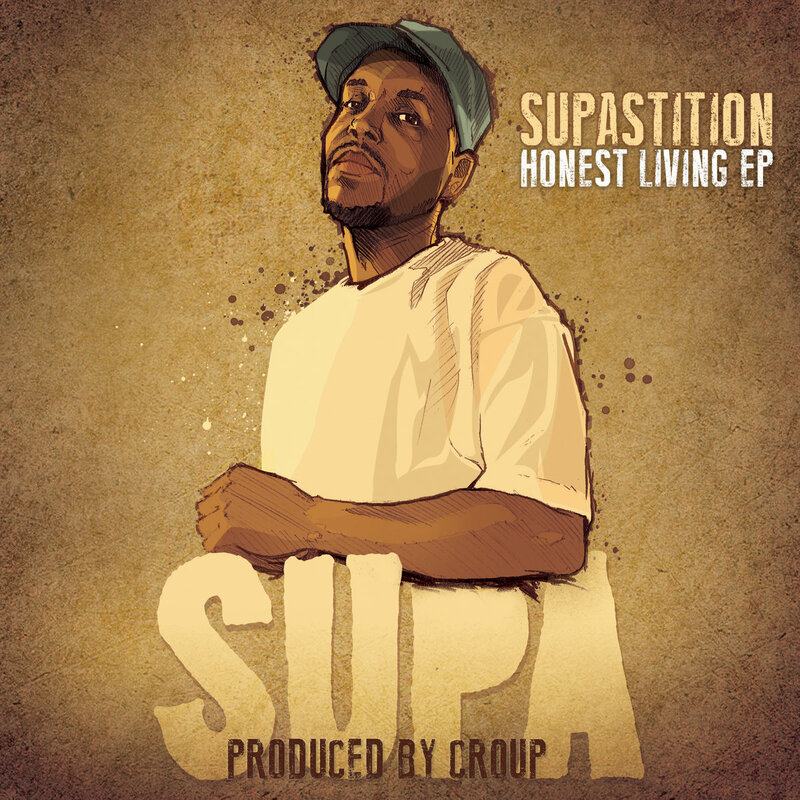 Rap that tells stories and has a serious sense of purpose like that on “Honest Living EP” is usually less focused on the skill and impressiveness of the rapper and more focused on the lyrics, but Supastition is an exceptional rapper. It might almost go unnoticed, with how important the lyrics themselves are. But he’s clear and concise, a no-frills artist. The EP’s producer, previous collaborator Croup, acts as the same. The EP is perfectly produced, filled with simple beats and no theatrics. “Honest Living EP” is an inspired and honest work. There is no boasting, no violence, no NY vs. LA, and no Tom Ford namedrops. It is a vintage, down-to-earth release about economic struggles in North Carolina. Simple music for complex lyrics, and a cohesive EP from a man just trying to make a living. While there’s nothing wrong with big-shot hip-hop royalty, it’s so far removed from what rap used to be. “Honest Living EP” goes back to an old school sound, with lyrics of honest struggles. The album can be streamed and downloaded for free on bandcamp, but doesn’t it deserve a few bucks?